What had been inevitable for a couple of weeks was finally confirmed as the Poppies claimed a 1-0 victory at Halesowen Town, whose relegation was rubber-stamped as a result. But this ended up being a day of celebration for Marcus Law, his players and their jubilant fans who travelled to the West Midlands in their numbers. It was very much a day to get the job done and while they have produced more polished displays this season, Kettering did what they had to do to wrap things up. And no-one can say they don’t deserve it. Right from the start of the campaign when they won their first six matches the Poppies have been the team to beat but, as has now been confirmed, they simply just had a bit too much for everyone else. The Poppies made a sluggish start to this game and Samuel Dallow sent a header off target for the hosts. But it wasn’t long before Kettering were in their stride and Hoenes saw a shot deflected wide after leaving two defenders for dead. And it was Hoenes who made the all-important breakthrough on 19 minutes. Dion Kelly-Evans was released down the right and his low cross was guided home by the the Poppies’ top scorer, much to the delight of the big travelling support. Kelly-Evans’ afternoon was cut shot by injury with Gary Stohrer replacing him but Kettering were comfortable for the rest of the half and went close to doubling their lead before the break with Daniel Platt making a fine save to deny Lindon Meikle after he had cut in from the left. Michael Richens headed just off target from a corner early in the second period but it wasn’t until the final 10 minutes that the next clear chance was created. Substitute Ben Milnes took aim with a 20-yard free-kick. 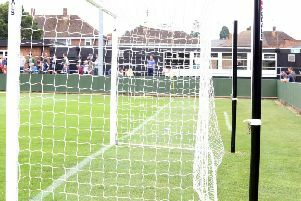 Platt was unable to hold on but the goalkeeper recovered brilliantly to turn Dan Holman’s header over the bar when the striker looked certain to score. But it all turned a bit nervy towards the end as Halesowen desperately tried to get bodies forward in a bid to postpone their relegation. And they should have levelled when Aaron Gilpin was played in but blazed over the bar with just Paul White to beat. Marcus Kelly saw an effort scrambled clear at the other end and was then denied by Platt after being played in on the counter-attack. 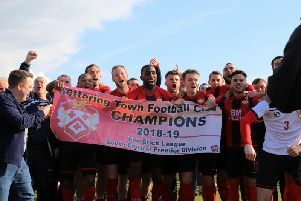 But it didn’t matter as the final whistle was followed by memorable scenes of celebration on the pitch and the Poppies and their supporters can now savour the moment in the final three matches of the season. Halesowen: Platt; Ekongo, Morris, Mendez-Jones, Griffiths; Dallow (sub Gilpin, 65 mins), Birch, Lawton, J Kelly (sub Hughes, 82 mins); Molyneux (sub Marseila, 66 mins), O’Neill-Martin. Subs not used: Nabi, Charlton. Poppies: White; Kelly-Evans (sub Stohrer, 32 mins), Towers, Stanley (sub Solkhon, 74 mins), Rowe-Turner; Richens, Meikle, M Kelly; Holman, O’Connor, Hoenes (sub Milnes, 71 mins). Subs not used: Brighton, Toseland. Goal: Hoenes (19 mins, 0-1). Bookings: Lawton (foul), Gilpin (diving).